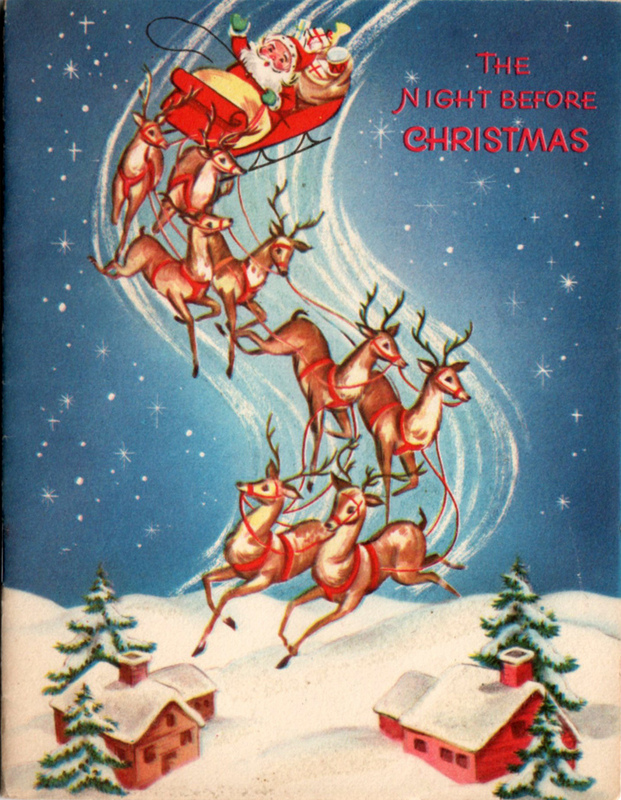 This much-loved seasonal rhyme is the basis for much of the ‘folklore’ surrounding good old Santa Claus, but what is especially intriguing is that it was first published anonymously in 1823 and ever since then, the authorship has been somewhat questionable. I always felt that it was such a generous gift – to write a magical poem such as this and never claim the glory for it. Who would have the generosity of spirit to do that? Well, in 1837 the poem was attributed to the American poet, Clement Clarke Moore (they just don’t name ’em like that these days!) and in 1844 he included the poem in an anthology, cementing his authorship of the poem. Apparently, an acquaintance of his had sent the poem to the Troy Sentinel, as it was something he had written for his children and did not consider it to be anything more than a frivolity. Which is a convincing argument – I remember reading that the composer Camille Saint-Saens was reluctant to publish his ‘Carnival of the Animals’ as it would detract from his more serious work. Equally, this is probably his most popular work, so you never know, do you?! Anyway, getting back to The Night Before Christmas, a professor of English in New York by the name of Donald Foster has challenged the authorship and believes that it was written by Henry Livingston Jr., a New York poet with Dutch and Scottish roots. Having analysed the text, he was convinced that the phraseology and the optimistic approach was much more consistent with Livingston’s style than Moore’s. But the real argument (in my opinion) is Livingston’s Dutch heritage. The references to Saint Nicholas are very closely related to the Dutch ‘Sinteklaes’ tradition, with the reindeer names originally printed as ‘Dunder and Blixem’, Dutch for thunder and lightening. Despite the fact that Livingston’s children also claimed that he had read them the poem before its publication, he never claimed authorship himself. Maybe it’s just the fact that I always root for the underdog, but for whatever reason, my money is on Livingston. Maybe it was his gift to the world at Christmas and he didn’t require any recognition. Either way, it is the most magical Christmas poem ever written and you can enjoy it in full here. And if you’re looking for a book to lose yourself in over the holidays, why not get a copy of The Heirloom or The Mysterious Bakery On Rue De Paris… There’s no controversy over the authorship either! Previous Post Go on, sure it’s Christmas!